Carron offer a brilliant range of fireplace surrounds in a variety of contemporary and traditional styles and finishes to make sure that there is one that is perfect for your home. Carron have made sure that each fireplace is unique with its original detailing and stylish features to complement the fire that has been chosen. One of the finest surrounds that Carron offers is the Buckingham cast iron surround which features intricate detailing throughout the header and the legs that show the true quality of the material and the work that has gone into it. The Buckingham is one of the largest surrounds that Carron has to offer with a top shelf of 1730 mm which makes it more suitable for a large room. Carron have some of the finest materials available with their surrounds such as solid oak, solid pine, cast iron, sheesham and solid acacia. These materials ensure that the surrounds supplied by Carron are amongst the best currently available in the UK. Some of the more contemporary designs are mainly available in hardwood and come with simple clean designs that would suit any room. One of the best contemporary hard wood surrounds is the Vermont which is made from natural solid sheesham which provides a traditional feel to a contemporary styled surround. One of the most unique surrounds that Carron has to offer is the Somerset Cast Iron because it is capable of adjusting the legs to change its opening width from anywhere between 940 mm -1020 mm. This feature is extremely useful when selecting a fire because it provides a lot more freedom of choice and also helps when installing the fire so that it fits perfectly into the surround. 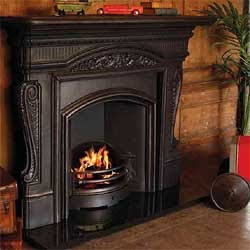 All of the surrounds that Carron supply are available with a black granite hearth in a variety of different sizes and also with the options of a tongue and also a slabbed hearth which is required with a solid fuel fire.